Rhesus macaques and capuchin monkeys can find a stable solution when playing a competitive game in which one opponent always does better than the other, but only humans can find a solution that benefits both competitors equally, turning a competitive situation into a cooperative one, according to a Georgia State University study. The findings advance scientists' understanding of the evolutionary trajectory of human decision-making. 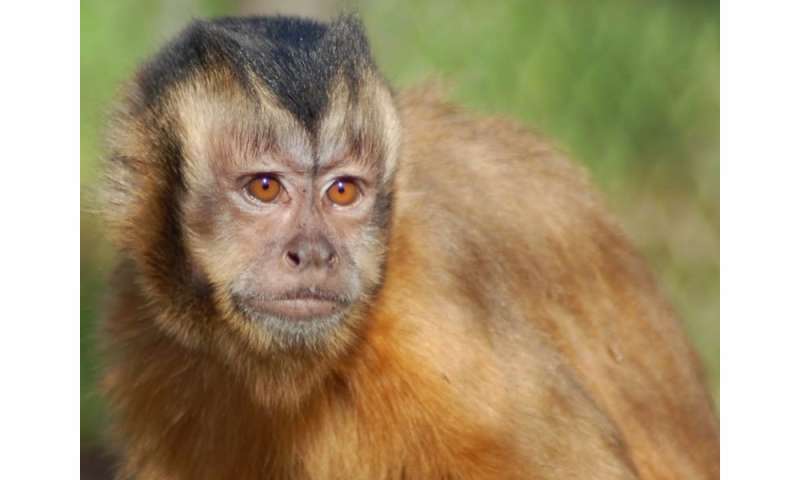 The study authors examined social decision-making in three species: capuchin monkeys, rhesus macaques and humans. Participants were given two versions of a classic game of conflict known as "Hawk–Dove," in which two players compete over a shared resource. Opponents can choose to play one of two tokens: "Fight" or "Yield." The competitor who plays "Fight" will receive the larger reward, but if both competitors play "Fight" the reward is withheld. If both choose "Yield," they each receive a smaller reward. The solution is to find what's known as a Nash equilibrium, in which neither opponent can do better by playing an alternate strategy. In this case, the most mutually beneficial strategy is the so-called "alternating" Nash, in which players alternate who plays "Fight" and who plays "Yield." In the study, published in the Journal of Economic Behavior & Organization, the subjects were presented with two versions of the game. In one version, both players' choices were immediately visible. In the other version, the players' choices were hidden until they had both made a decision. Human subjects received no instruction on the game strategy, and no species received any pre-trial training or testing. Both species of primates were able to find a single asymmetric Nash equilibrium, in which one opponent repeatedly plays "Fight" while the other repeatedly plays "Yield." However, they could only do so when the opponents' choices were immediately visible. "We were surprised that the monkeys were able to find a stable solution, and fairly rapidly," said lead study author Sarah Brosnan, professor of psychology at Georgia State. "But we were especially surprised by the capuchins, which we had predicted would not be able to find Nash equilibrium. In previous studies, those subjects could only solve a coordination task by matching their partner's play. 'Anti-matching,' or playing opposite tokens, is more cognitively challenging than matching, so the animals really outperformed our expectations." Brosnan said findings from these kinds of game studies can help scientists make better predictions about how primates will behave in more natural situations. Of the study participants, humans were the most likely to regularly play a Nash equilibrium. They were also the only species to find alternating Nash equilibria, in which opponents take turns playing either "Fight" or "Yield" to equitably distribute the maximum award. "This suggests that humans of the same social group are looking for ways to cooperate," said Brosnan. "The implication that humans are well-adapted to find a solution in a competition over resources may say something about the unique challenges faced during the evolution of our species."